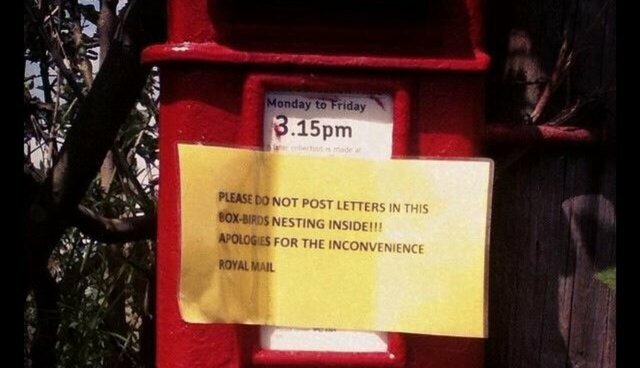 The normal flow of mail in one English town has been charmingly disrupted by a feathered squatter. Residents of Orford have been asked to refrain from putting their letters inside a mailbox in town after postal workers discovered that a bird had decided it was actually going to be a birdhouse now. 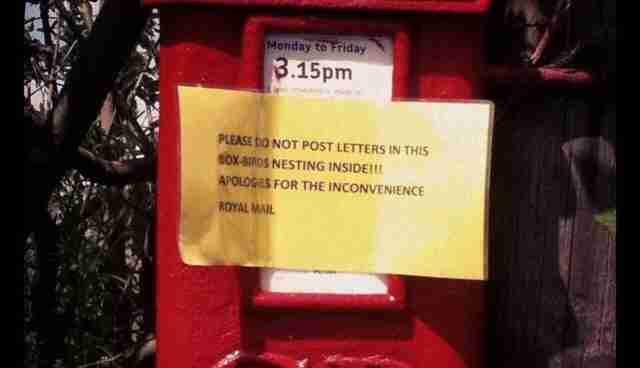 Instead of evicting the nesting creature, the Royal Mail service sided with the bird, issuing an apology to its customers for the inconvenience -- though it's hard to imagine anyone really minds. "We'd certainly like to thank the Royal Mail for considering wildlife and putting the sign up," says Audrey Boyle of the Suffolk Wildlife Trust, to the BBC.